Catalonia has traditionally looked at Israel as a role model, a successful country rising from the ashes and succeeding through sheer hard work. 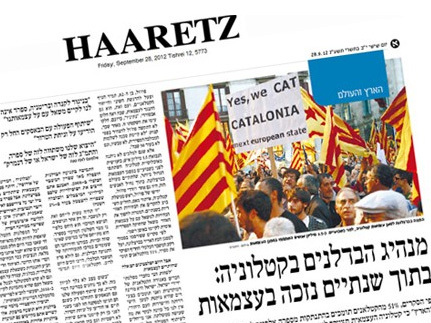 From the recovery of Hebrew as a living language, to the turning of the desert into a market garden, including the high professional standards achieved by her Armed Forces, Catalans have always seen many lessons to be learned from Israel. This was true even when independence was seen by many as a distant dream. Now that it has become the majority option, there are even stronger reasons to reinforce links with Israel. It thus came as no surprise to see a member of the Catalan Government take part in the celebrations of the 65th anniversary of the creation of the state of Israel. On 21 April, Justice Minister Germa Gordó visited Hatikva School, in Valldoreix, where he participated in a number of events organized by the Jewish community. In his address, Gordó praised Israel for its capacity to develop new products and technologies in the most dynamic industries. The justice minister explained that Israeli products and companies were competing in those sectors featuring the most advanced technologies, including communications, computing, pharmaceuticals, and biotechnology.